On Friday evening Greg and I headed over to the Violet Crown to see Phantom Thread, the latest and supposedly last film of the formidable Daniel Day-Lewis. He portrays Reynolds Woodcock, a British couturier in 1950's London with impeccable taste and a rather extreme and demanding temperament. If I were to choose an astrological sign for him Virgo comes to mind with his obsession to detail mixed with a bit of the cardinal signs of Capricorn and Aires who tend toward control. This compulsion for attentions to intricate parts of a whole, intense work ethic and commanding others is inherent in most genius artists who are committed to mastery and a defined aesthetic, Coco Chanel is a great example. The film is beautifully rich, threaded with symbolic messages which hid themselves at first, presenting themselves on a conscious level as I continued to ponder and savor all the little details carefully stitched throughout—literally and metaphorically. Film maker and director Paul Thomas Anderson co-wrote and produced this glamour packed, elegant morsel with Daniel-Day, previously the two had collaborated on There Will Be Blood (2007). Mr. Anderson also undertook the role of "director of photography" which leads one to speculate that he himself contains some of the same eccentric devotions to quality we see in Mr. Woodcock. The film also stars Vicky Krieps as Alma, his strong willed, young muse and Lesley Manville as Cyril, the very discerning and observant assistant and sister. Both Alma and Cyril have a similar look, which before I knew of the brother/sister relationship, had me speculating that the two red heads may have metaphorically been aspects of the same character. Something else to note is that the word alma means soul in Spanish. Viscerally compelling from the start where we get a glimpse into Mr. Woodcock as master craftsman in the fashion house of a post war, London master craftsman and his entourage of assistants as they arrive at dawn and put on their uniforms. 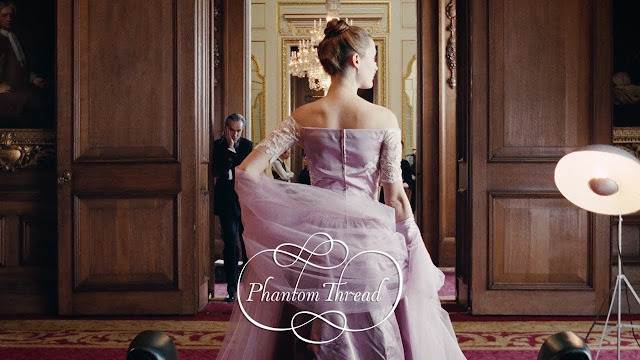 The exquisite scrolling, calligraphic title is what captured me instantly in the trailer, followed by the setting of Londons mid century, high glamour fashion world coupled with Daniel Dy-Lewis and Paul Thomas. The haunting soundtrack weaved throughout was composed by Jonny Greenwood. Before continuing, I recommend to STOP READING from this point forward so that you can view this cinematic gem in pure ignorance of the spoilers I am about to share. As we drove out of the parking lot of the theater, Greg shared that he found the film troubling and was left with an uncomfortable feeling. I on the other hand didn't have that impression, in my mind I thought how in a way it was a modern day Taming of the Shrew in reverse. And to be completely honest, can see how in a partnership there are all sorts of issues going on simultaneously as each person makes concessions, or not, for the other—or over time one becomes resentful of the other. Relationships, especially close ones, are extremely complicated, as I am sure you are keenly aware of. To be the wife of a celebrated artist with a healthy ego can be anguish, daunting and constantly work on your own self esteem, it demands you to stand up and be heard, even when the other has no interest in having his shadowy self revealed. So, where Greg was made uncomfortable, I relish Alma finding her own way of dealing with the bully and bringing him to his knees in an act of equanimity. Another intriguing aspect that came to mind was how Alma, symbolic of the creative, circular womb, would go out into the forest to harvest mushrooms. I thought about how in many of the old faery tales untamed nature is so often needed to bring restoration to a life out of balance. There is also the concept of the mushrooms acting as a detox. 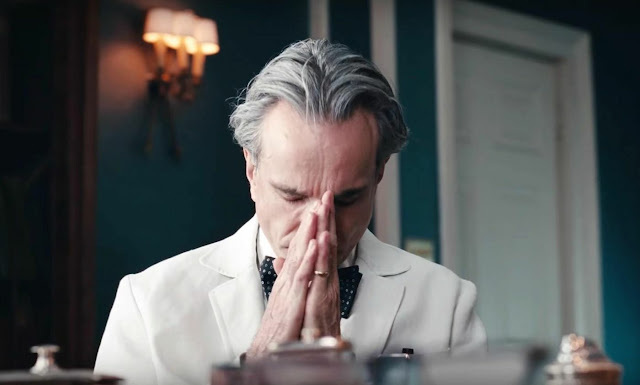 I'm sure as I continue to contemplate Phantom Thread and see it again and again, more of its inner linings will be revealed. Thank you for that beautiful rendering of this film. I certainly want to see it based on the fashion design aspect and your feelings about it. Hi E. Richard, if you are interested in fashion design then you will adore this film and the depiction of the genre. Please let me know what you think after seeing it.